If one walks away from Qutub Minar finding solace and solitude, the nearest Mehrauli Archaeological Park is the best choice. In the park lies the tomb of Mohd. Quli Khan, the believed foster brother of the Akbar. Born to Maham Anga, the foster mother of the emperor Akbar, Quli Khan was a general in Akbar’s army. Except that not much is known about the person to whom the tomb is dedicated. The grand Mughal architecture is the testimony of Quli Khan’s significance in Akbar’s life. The date of construction is not known, neither is the name of the King who commissioned the monument. The tomb resembles the design of Mughal architecture with an entrance on alternate sides, calligraphy on the walls, the medallions are either engraved with Quranic verses or decorated with floral calligraphy. The monument lies on an elevated platform surrounded by stairs on alternative sides to reach to the tomb. The monument during the end of Mughal era was leased to Sir Thomas Theophilus Metcalfe, who was an agent to the Governor of India to the imperial court of Bahadur Shah Zafar, the last Mughal emperor. The tomb was referred to as Dilkusha, meaning delight of the heart. Today, the monument is a protected site, with whole Mehrauli Archaeological Park under the care and maintenance of Archeological Survey of India. The monument’s exact year of construction is not known with many speculating that it was built during Jahangir’s rule. The monument is dedicated to Quli Khan who was a foster brother to Akbar and Quli Khan is believed to have served in the army of Akbar. The monument was leased to Sir Thomas Theophilus Metcalfe by last Mughal emperor Bahadur Shah Zafar. The monument was restored by Metcalfe, who added some more elements to the monument like gates and converted the monument into a destination for honeymoon used by Royal British officers. During the revolt of 1857, the monument suffered some damage. However, with the passage of time, the tomb suffered erosion. It was INTACH, who took the responsibility of restoring the monument to its original glory. The complex of the monument was restored and refurbished. Today, however, the monument is covered by thick vegetations, with its wall camouflaged in the wild vegetations that have overtaken the complex. 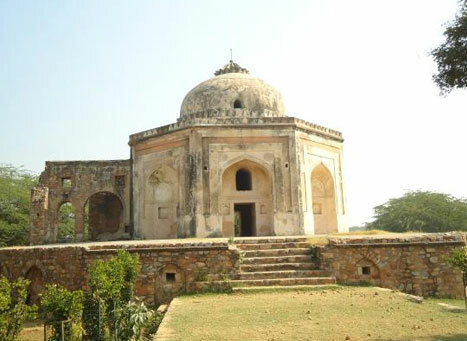 One of the many monuments under the Archaeological Survey of India, Quli Khan tomb is one monument not to be missed. The nearest metro station to Mehrauli Archaeological Park is the Qutub Minar metro station on the Yellow line of Delhi Metro. From there you can take an auto reach to the monument. One can visit the nearby Qutub Minar complex which is a UNESCO World Heritage Site in India. The Qutub complex is one of the major tourist attractions in Delhi. You can explore the monuments inside the Qutub complex. Also, explore the Mehrauli on a bicycle. The Quli Khan’s Tomb is open all days of the week from sunrise to sunset. There is no entry fee for visiting Quli Khan’s Tomb. The monument can be visited any time of the year, however, winters are the best time to explore Delhi.